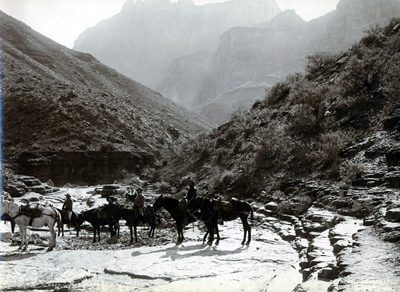 William Henry Jackson (1843-1942) Across the Canyon, c. 1890, Silver Gelatin Print, 9" x 12"
The development of national parks to preserve the grandeur of the West for everyone owes its beginnings to photographs taken by artists such as William Henry Jackson that were presented to Congress. 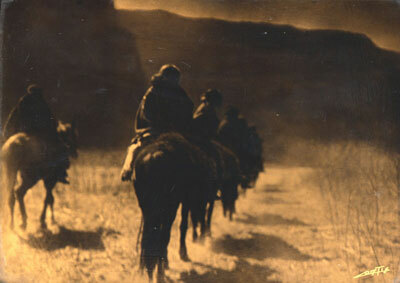 Jackson’s photographs, taken while participating in the Hayden Geological Survey in 1871, along with the paintings of artists Thomas Moran, led to the establishment of Yellowstone National Park in 1872, the first of nearly 400 national parks. Jackson lugged his equipment – capable of holding glass plates up to 18 by 22 inches – through extraordinarily difficult conditions. His photographs were documentary evidence of scenes that up to then had been the subject of rumor. In 1872, 300 people visited Yellowstone. Today the park receives over 3 million visitors each year. Many of these visitors are armed with point-and-shoot cameras that now often record a disappointing representation of the scenes that inspired them to shoot. 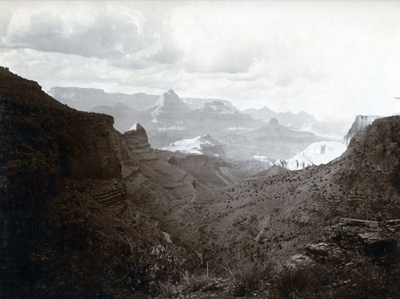 William Henry Jackson (1843-1942) Water Pockets, c. 1890, Silver Gelatin Print, 9" x 12"
Taking and printing a photograph that presents the subtlety and the grandeur of a landscape requires great skill. When I was a student at a fotoskolen in Denmark, we went downtown to the chemist to purchase the ingredients to make the baths needed to develop film and adjusting the chemicals in a carefully calculated process, the wide range of tones and brightness from white to black in nature, could be “condensed” onto the film. With the same precise control, the negative could produce a dramatic print. Today much of this control and manipulation takes place on a computer. However, without the initial inspiration, no amount of carefully mixed chemicals or computer skill will help. 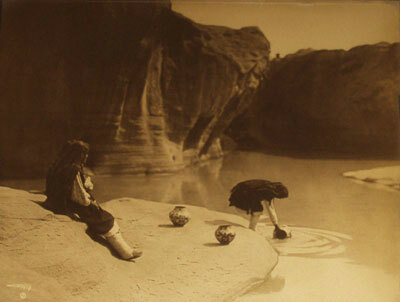 Edward S. Curtis (1868-1952) Vanishing Race, Orotone, 8" x 10"
Edward S. Curtis (1868-1952) At the Old Well of Acoma, Orotone, c. 1904, 10.5" x 13.5"
Edward S. Curtis (1868-1952) Before the Storm - Apache, Orotone, 8" x 10"
Many of his images were printed on glass with a gold colored pigment and mounted in ornate period frames. One of these is Canyon de Chelly, an image of seven Navajo men on horseback (and one dog) riding along the dry riverbed in the majestic canyon that has been inhabited for 2,000 years. Ruins of buildings from the Anasazi civilization of about 1,200 BCE dot the arms of the canyon. 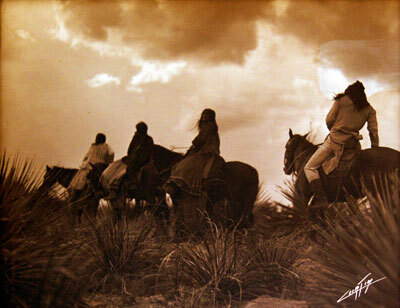 The Navajo have lived and farmed there for over 300 years.